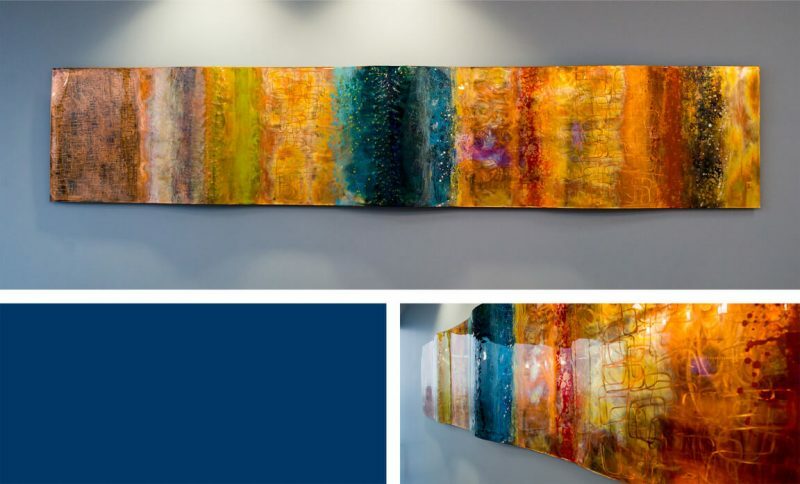 Using traditional techniques from painting, Ken Rausch takes his work a step further by creating exciting, richly colored works on an unexpected canvas....Copper. He utilizes heat and acid etching, along with special paints, to create works that are iridescent, intense, and beautiful. He also uses specialized grinding tools to create texture and depth. The top coat is a multi-layered resin that gives an almost “glass-like” feel to each piece. The result is a painting that takes on a personality of its own as light hits the surface. Ken is native to Greater Cincinnati, and still calls the area home. He graduated with honors from the Art Academy of Cincinnati, and his works in metal have found their place in numerous private and corporate collections throughout the US, Canada and Panama.